Hey guys! Up for sale is a number of nice pieces priced between 50-60% retail prices. Items are as followed in order of the pictures. Cold Steel Hand and a Half sword, NOT the Man at Arms version, the nicer one. In excellent shape with the original scabbard, could use a sharpen, but still relatively sharp. 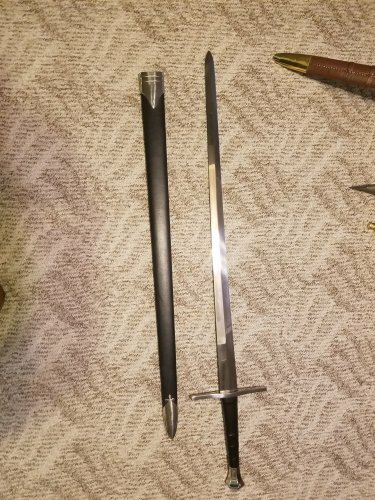 $125 Windlass Lueterit Viking Sword, professionally sharpened, with original scarbbard, but fits loosely. Excellent overall shape, there are blemishes on the hilt that have been closely photographed. $125 Windlass Greek Hoplite Sword, almost factory new, the edges are blunt from Windlass, small cut in leather wrapping on handle closely photographed. $80 Windlass 16th Century Italian Mace, in excellent shape, the wire wrapping around the leather of the handle starting to come loose at the base of the handle, ran out of pictures to get it up close but the photo with the mace and the flail in it shows it fairly well. $50 Military Flail, looks exactly how I got it new from Kult of Athena, no brand information provided. $20 If you want the whole lot for $400, I will ship it all for free! Thank you for looking at my listing, let me know how I can help you.